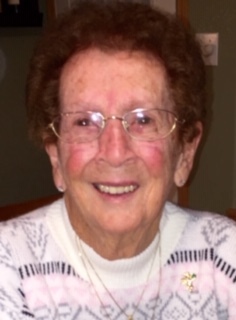 Obituary for Jean C. Klinger | Dimon Funeral Home and Cremation Services, Inc.
Jean Calnon Klinger, formerly of Williamstown, currently residing in Wyoming with her son and daughter-in-law, passed away peacefully March 9th. Born in Williamstown, January 16, 1928, a daughter of the late Thomas L. and Mary Jones Calnon. She was also preceded in death by her husband Robert "Mutza" Klinger, an infant grandson Adam Klinger and her brother T. Leroy "Buddy" Calnon. Jean graduated from the former Williamstown High School She worked as a secretary at Williams Valley Junior Senior High School for 22 1/2 years. She was a member of the Immanuel Lutheran Church, Williamstown where she was a member of the choir and also a member of the Williams Valley Community Choir. She is survived by her children, David and his wife Joann (Heimbaugh), Douglas, WY; Brad and his wife Bonnie (Boyer), Mechanicsburg and Wendy wife of the late James Mahoney, Harrisonburg, VA; six grandchildren and nine great-grandchildren.